To find out about the founder of the system of Reiki we have included a brief history of his life. Excerpts from the Usui Mikao’s Memorial Stone are in quotes. Usui Mikao was born on the 15th of August 1865 in the village of Taniai (now called Miyama cho) in the Yamagata county of the Gifu Prefecture in Japan. Japan was just opening up in 1865 after a self-imposed exile which had left it culturally prosperous though far behind the Western world technologically and militarily. Kyoto was the capital of Japan and remained so until 1868 when the advent of the Meiji Restoration moved it Tokyo. Today in Miyamo cho, Usui Mikao’s name can be found carved on a large torii gate at the Amataka shrine close to where his home once stood. The three Usui brothers donated the stone torii in April 1923. Usui Mikao’s brothers, Sanya and Kuniji, grew up to become a doctor and a policeman respectively. He also had an older sister called Tsuru. Usui Mikao’s father’s name was Uzaemon and his mother was from the Kawai family. Usui Mikao was born into a society based on a class system. There was the privileged class to which he belonged and then there were the common people. Common people were not even permitted the luxury of surnames until 1870. Usui Mikao’s family was hatamoto samurai – a high level within the ranks of samurai. The hatamoto were the shogun’s personal guard. Due to the major changes that were happening in Japan from the 1860s onwards, the samurai class were no longer required. The memorial stones states that the famous samurai, Tsunetane Chiba (1118 to 1201) was Usui Mikao’s ancestor. Recently Hiroshi Doi noted that this was incorrect and that it was in fact Toshitane Chiba, a famous samurai warlord from the 1500s. In 1551 he conquered the city Usui and thereafter all family members acquired that name. Whether the ancestor was Tsunetane or Toshitane or both is inconsequential, both were from the Chiba clan, as was Usui Mikao. The Chiba clan was once an influential samurai family in Japan according to Chiba family records. The Usui family crest, otherwise known as the Chiba crest, is designed as a circle with a dot at the top. The circle represents the universe, and the dot (a Japanese representation for a star) represents the North Star. The North Star never moves while the universe must move around it. You can see this crest here above at the right from a photo taken at Usui’s gravesite in Tokyo. Usui Mikao was born a Tendai Buddhist and as a young child studied in a Tendai monastery according to recent researchers. In the West, it was once believed that he was born a Christian. Hawayo Takata probably added this information as a reaction to the anti-Japanese sentiment in America during and after World War II. Christianity was actually outlawed in Japan at the time Usui Mikao was born. According to the teachings of Suzuki san, Usui Mikao began with the practice of a martial arts called aiki jutsu at the age of 12. He also studied an early form of Daito ryu and gained Menkyo Kaiden (the highest license of proficiency) in weaponry and grappling in 1889. From his youth he surpassed his fellows in hard work and endeavor. When he grew up he visited Europe and America, and studied in China. He was by nature versatile and loved to read books. He engaged himself in history books, medical books, Buddhist scriptures, Christian scriptures and was well versed in psychology, Taoism, even in the art of divination, incantation, and physiognomy. Men of Usui Mikao’s social class were trained well in the arts. Funakoshi Gichin, the modern founder of Karate, wrote that he went to a ‘moon viewing party’ when he was a young karateka. This consisted of martial artists sitting around, chatting about karate and reciting poetry under the moon. Chris Marsh states that Funakoshi, Kano Jigoro (founder of judo) and Ueshiba Morihei (founder of aikido) knew Usui Mikao. Usui Mikao has shown his leaning toward poetry by his inclusion of 125 waka, or poems, into his teachings. During Japan’s ‘national isolation’ there had been a great focus on the arts including classical Chinese works. In a book from 1933, a student of Usui Mikao describes a technique called hatsurei ho. Here waka is recited silently to one’s self in an attempt to become One with it. In Mochizuki Toshitaka’s book there is a group photo in which Usui Mikao, friends, family and students are gathered together on the 16th of January 1926. Dave King claims that Tenon-in has told him that Kano is seen standing at the furthest right hand side of the picture. Though there is a slight resemblance this has been denied by every martial arts source contacted (This includes respected authorities such as the Kodokan Judo Institute in Japan, Stanley Pranin of the Aikido Journal, and Miek Skoss of Koryu Books). It’s also believed that Usui Mikao included techniques as well as jumon (jumon means spell or incantation) in his teachings that are based on Shinto and Tendai practices. Usui Mikao married Suzuki Sadako and they had two children, a boy and a girl called Fuji and Toshiko. Fuji (1908 – 1946) went on to teach at Tokyo University and Toshiko lived a short life, dying at the age of 22 in 1935. The entire family’s ashes are buried at the grave site at the Saihoji Temple in Tokyo. It is impossible to offer a commencement date for Usui Mikao’s teachings. He was 35 years old at the turn of the century and, as stated by students of Suzuki san (who claim to have seen his Menkyo Kaiden certificate) was proficient in martial arts from his mid-20s. Suzuki san had been aware of Usui Mikao her whole life as she was his wife’s cousin. Her formal training with him is said to have begun in 1915 when she was 20 years old and her relationship with him continued on a less formal basis until his death in 1926. It’s understood that Suzuki san and the other 11 living students have preserved a collection of papers including the precepts, waka, meditations, and teachings. In a translated 1928 article a student of Chujiro Hayashi states that the system was founded ‘decades ago’. For these reasons it is believed the teachings of Usui Mikao began long before 1922 when the Usui Reiki Ryoho Gakkai claims to have been created. What Usui Mikao taught was called ‘Usui do’ – ‘the way of Usui’, and what he practiced on people would most likely have been called ‘Usui teate’- meaning ‘hands-on’. Early students had never heard of the word Reiki in relation to the entirety of Usui Mikao’s teachings. It was also often used in conjunction with Usui Mikao’s teachings but not as the name of them merely in its literal form meaning ‘spiritual energy’. Only once it came to the West was the word ‘Reiki’ turned into the name for a system. The creation of this name can be seen in Alice Takata’s Gray Book. It is believed that the aim of these teachings was to provide a method for students to achieve enlightenment. Unlike religion, though, there was no belief system attached. Though enlightenment was the aim, the healing that was taking place for students was a wonderful ‘side effect’. What sets Usui Mikao’s teachings apart from other hands-on healing methods is his use of reiju or attunement to remind students of their spiritual connection. It seems that all students of Usui Mikao received reiju and the 5 precepts and those with a further interest in the teachings became dedicated students. There does not appear to have been a distinction between clients and students in the beginning though this changed in 1917. People began coming to Usui Mikao for different purposes – some for healing and others for the spiritual teachings. Right is a photo from the book of a student of Usui’s called Tomita Kaiji from 1933. 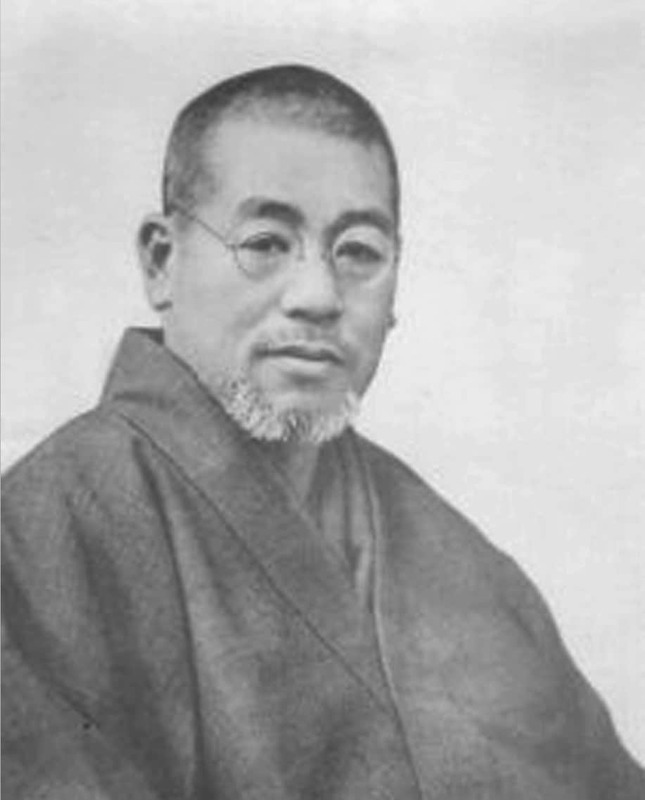 Usui Mikao is said, by students of Suzuki san, to initially have given mantras to students as a device for tapping into specific elements of energy. As each individual learns in his/her own unique manner just one device was impractical to serve the whole of mankind. Meditations too, became integrated into the teachings. Once the Usui Reiki Ryoho Gakkai was formed the teachings became more formalized. Hand positions were taught to those who found working intuitively difficult. Symbols were also added to the mantra recitations as a helpful tool to evoke specific energy. The introduction of symbols was useful for those whose experiences with spiritual work had previously been limited or those who had difficulty sensing the energy. Whether mantras, meditations or mantras and symbols together were practiced it did not matter as all were focused on working with the same energy. According to the memorial stone Usui Mikao’s teachings were developed, almost miraculously, during a meditation in 1922. One day, he climbed kurama yama and after 21 days of a severe discipline without eating, he suddenly felt One Great Reiki over his head and attained enlightenment and he obtained Reiki Ryoho. Then, he tried it on himself and experimented on his family members. The efficacy was immediate. Usui Mikao’s 21-day practice on kurama yama was called kushu shinren, (which is a form of shugyo, or discipline or training) according to the memorial stone’s translator, Hyakuten Inamoto. As hiei zan is the main Tendai complex in Japan, and is very close to Kyoto it has been surmised that Usui Mikao would also have practiced there if he was a lay priest. A Tendai meditation practice called zazen shikan taza (according to Suzuki san’s students) may well have inspired him and his teachings either on hiei zan or kurama yama. Sensei thought that it would be far better to offer it widely to the general public and share its benefits than just to improve the well-being of his own family members. In April of the 11th year of Taisho (1922 A.D.) he settled in Harajuku, Aoyama, Tokyo and set up the Gakkai to teach Reiki Ryoho and give treatments. Even outside of the building it was full of pairs of shoes of the visitors who had come from far and near. This earthquake may well have been the background inspiration for Hawayo Takata’s well-known ‘beggar story’. There was a great deal of poverty in Japan at that time due to the depression. After the earthquake Usui Mikao moved his home and place of teaching to Nakano ku, outside of Tokyo, in 1925. He was often invited to travel throughout Japan treating people and teaching students. Usui Mikao had over 2000 students in total (according to the memorial stone), and 21 teacher students who reached shinpiden (according to Hiroshi Doi). Sensei’s personality was gentle and modest and he never behaved ostentatiously. His physique was large and sturdy. He always wore a contented smile. Due to his respected and far-reaching reputation many people from local districts wished to invite him. Sensei, accepting the invitations, went to Kure and then to Hiroshima and Saga, and reached Fukuyama. Unexpectedly he became ill and passed away there. It was March 9 of the 15th year of Taisho (1926 A.D.), aged 62. These are truly great teachings for cultivation and discipline that agree with those great teachings of the ancient sages and the wise. Sensei named these teachings ‘Secret Method to Invite Happiness’ and ‘Miraculous Medicine to Cure All Diseases’; notice the outstanding features of the teachings. Furthermore, when it comes to teaching, it should be as easy and common as possible, nothing lofty. Another noted feature is that during sitting in silent meditation with Gassho and reciting the Five Precepts mornings and evenings, the pure and healthy minds can be cultivated and put into practice in one’s daily routine. This is the reason why Reiho is easily obtained by anyone.